The ChartTrackBallBehavior can display a vertical line across the chart plot area and also displayvisual indicators (rectangle by default) at points where the trackball line crosses the visualization of a series object. 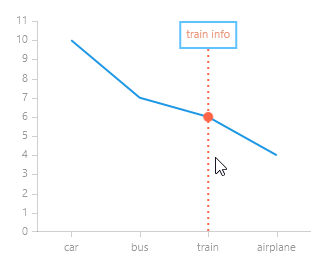 ShowInfo (bool): Determines whether the visual information for all the closest data points will be displayed. ShowIntersectionPoints (bool): Determines whether a visual representation for all the intersection points will be displayed. SnapMode (TrackBallSnapMode): Gets or sets how this behavior should snap to the closest to a physical location data points. None: The trackball will not be snapped to any of the closest data points. ClosestPoint: The behavior will snap to the closest data point, regardless of the chart series that own it. AllClosePoints: The behavior will snap to the closest data points from all chart series. InfoMode (TrackInfoMode): Gets or sets a value indicating whether the track information will displayed be displayed for whole series or individual data points. Multiple: Each series information is displayed in a box on top of the plot area. Individual: A tooltip-like box is displayed next to each intersection data point. TrackInfoTemplate (attached property): Specifies the DataTemplate for the displayed information on a per series/indicator basis. This property has to be attached to a chart series/indicator. 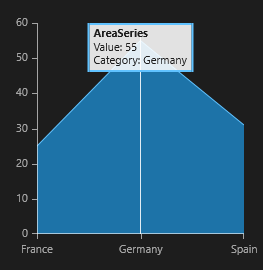 IntersectionTemplate (attached property): Specifies the DataTemplate for the intersection point on a per series/indicator basis. This property has to be attached to a chart series/indicator. LineStyle (Style): Gets or sets the Style that defines the appearance of the vertical line that marks the position of the trackball. The Style should target the Polyline type. InfoStyle: Gets or sets the Style that defines the appearance of the TrackInfo control displayed by a ChartTrackBallBehavior instance. The Style should target the TrackBallInfoControl type defined in the Telerik.UI.Xaml.Controls.Chart.Primitives namespace. >The InfoStyle property affects the Style of the TrackBallInfoControl only when the ChartTrackBallBehavior.InfoMode isMultiple. change the template of the intersection point with the series line. First, let us create a data class. Here is the definition of the chart control with custom styles for the track ball elements. Here we set the ItemsSource of the chart to a collection of Data items. You can see that in the TrackInfoTemplate we can access the DataPoint and the underlying DataItem as well.